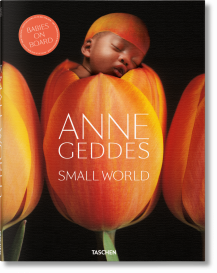 Anne Geddes (born 1956) is one of the world’s most unique photographers, whose beloved imagery of infants and parenthood has been published in over 84 countries and 24 languages. A global ambassador for children, Geddes has her own Philanthropic Trust and is an Ambassador Volunteer for the March of Dimes and an Ambassador for the GSK global awareness campaign for meningococcal disease. This is her first book for TASCHEN.